I haven't written a lot in the last few months because frankly not much is going on in racing for the average joe trainer and owner in the U.S. Many are out of business as purse money fails to keep up with the expense of keeping a horse in training. This spring 2013, my husband and I are not involved in racing directly. Instead we're growing a racehorse quality hay crop on the farm of an Illinois thoroughbred breeder. We started the experiment last year, offering to cut and bale the hay in exchange for a percentage of the resulting bales. We would not have made it through the whole racing year in 2012 without the savings we had with this hay deal. 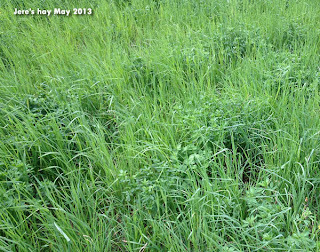 So this year we reseeded the hay fields early with what we consider the perfect racehorse hay - mostly timothy with some clover, orchard grass and alfalfa. We are currently anticipating the first cutting late May. So we've learned a lot about hay. I remember being on the racetrack back side back in the 1990's, walking by the famous stables at the track like D. Wayne Lukas, and seeing brightly colored and very uniform bales of timothy hay. I don't know how that hay gets the unnatural hue, but I do know it was very expensive. This expensive hay never had any sign of weeds in it. I think owners should know that feed and bedding is the 2nd highest expense that most trainers have, only after payroll. Fancy looking hay can only be considered superior in superficial appearance to less expensive but thoughtfully cultivated, cut and cured racehorse hay that may include a few weeds. On the subject of weeds, we only removed those weeds from the hay fields that horses won't eat or are harmful to eat. Horses know which weeds are bad for them and usually won't eat them unless they are starving. 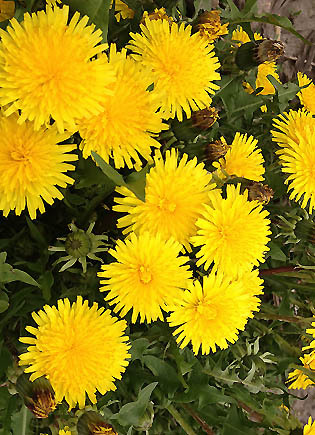 In addition, if you have ever watched a horse graze in the midwest USA, he will often go to two weeds, the dandelion and the plantain, before eating the grass. The dandelion flowers, leaves and roots have health benefits, and many "old-timers" know that dandelion is a natural diuretic - possibly a natural alternative to lasix/salix. 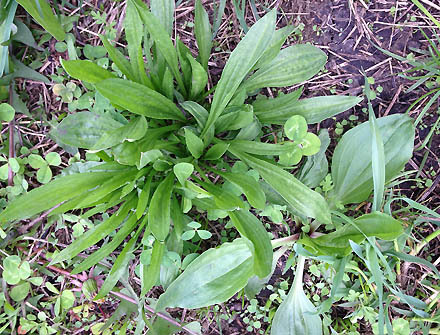 The plantain herb is said to have a myriad of medicinal benefits including speeding cell replacement. The photos show the dandelion and two common varieties of the plantain weed, one broad leafed and the other narrow leafed, both edible and beneficial. What we believe is that racehorses are finely tuned athletes that require finely managed daily care in their diet, training, competition and recovery routines. The most expensive routine is not necessarily the best, so we have to constantly keep learning while trying to make the best decisions for our horses.